Who says that great skin can be found only by paying a huge sum? Check your fruit basket, the secret of beautiful skin resides here too. Let’s take kiwi today to make amazing face masks which will make your skin revitalized and beautiful. But before you make the mask, know why this Australian native fruit enjoys a celebrated status in beauty segment. This fruit is one of the richest sources of vitamin C, as it contains 3 times more vitamin C than oranges. Its high mineral proportion is effective in regulating body’s fluid, pressure and electrolyte level. Presence of vitamin E and omega 3 fatty acids make it a great fruit for skin as well as health. Method – Peel the fruit and cut it in small pieces. Now, place these kiwi pieces in a jar along with curd and blend them together to make a fine paste. Once the pack is ready, apply it on your face and leave it for at least 30 minutes and then wash it off with lukewarm water. You’ll be amazed to see the glow of your face. Method – Peel the fruit and convert it into pulp with help of a grinder. Now add lemon juice into the pulp and mix nicely. Your lemon-kiwi face mask is ready for application. Leave this mask on face till it get dries and then wash it off with normal water. Method – Take the banana first, peel it and mash it into fine pulp. Add kiwi pulp into it along with the curd. Blend all of them together to make a thick paste. Keep it for thirty minutes on your face before washing it off. Method – Almond, kiwi pulp and besan all are great for skin. Besan is wonder skin cleanser as well as an exfoliant. While mixed with kiwi and banana, it greatly beautifies your skin. To make almond, kiwi and besan face mask, add all the ingredients together to make a paste. This mask gives the best result when left at least for 30 minutes. Kiwi fruit pulp is a great mask on its own too. Though, it tingles a little when applied directly on face but the end result comes great. 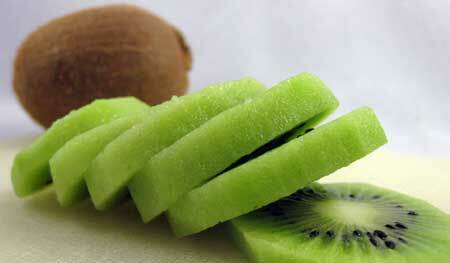 Method – Mix together kiwi fruit pulp and avocado pulp to form a creamy and smooth pulp. Apply this creamy pulp for 10 minutes on your face to get a rejuvenated skin. Method – Take a bowl and keep all the ingredients into it. Mix everything together and make a paste. Apply this paste on your face to get a wonderfully glowing skin. Mix a tablespoon of sandalwood powder with a table spoon of kiwi fruit pulp to make a sweet smelling facemask which keeps your skin cool and acne free. Method – Mix kiwi fruit juice and olive oil together to make a good face mask. Rub it on your skin and let it be there for 15 minutes. Now wash it off and follow the procedure with application of toner. Method – Place everything in a grinding jar and grind them to make a paste. This skin revitalizing mask also works as a skin exfoliator.